Just as fall brings the excitement of the first leaves crunching on the ground and the smell of pumpkin spice in the air, spring welcomes the first blooms on the trees, accompanied by heaping helpings of asparagus, berries and sweet iced drinks. This spring, I am happy to add some of my favorite dishes to the menu: Lemon Parmesan Fettuccini, Marinated French Chicken Breast, Five-Spice Striped Bass and The Mighty Vegetable Flight. The flavors here are inspired by the very simple (yet delicious) Spaghetti A Limone dish, which I enjoyed during my visit to Rome. My twist on this classic is very spring forward, with asparagus, english peas and mushrooms tossed in a lemony cream sauce. 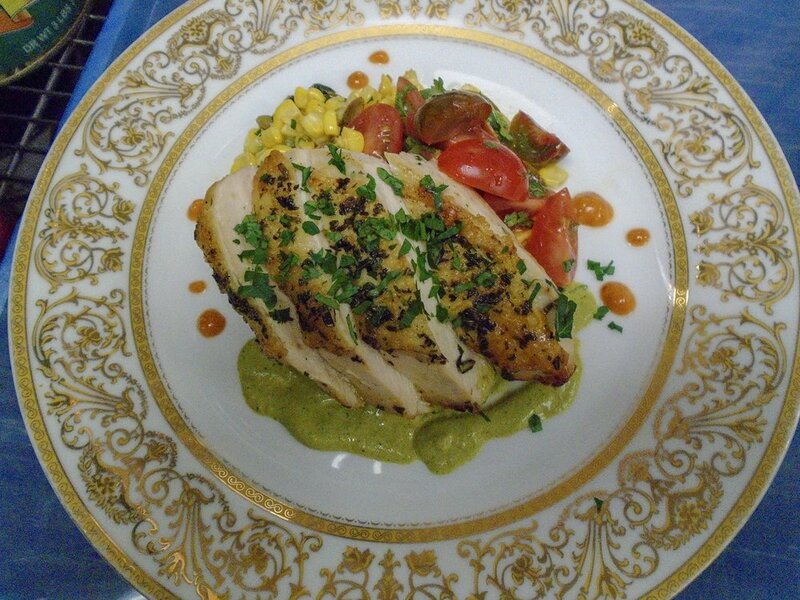 Our Marinated French Chicken Breast is a pre-settable entrée that takes on a south western flavor profile. When I first had Great Performances’ Pumpkin Seed and Poblano Crema entreé, I loved it, and built this dish around it since poblanos are by far my favorite pepper these days; we also spiked the corn salad with poblanos and cooled off the dish with a heirloom cherry tomato salad, embellished with cilantro and sherry vinaigrette. For the garnish, we start with a roasted tomato vinaigrette, with a touch of smoky chipotle peppers for a gentle heat, and finish with spiced pepitas, which are baked with lime juice for extra flavor. Our Five-Spiced Striped Bass is another favorite for this season. We use a fresh five-spiced blend crafted by the Le Sanctuaire team and source wild ocean striped bass for this dish. I love the Okinawa sweet potatoes for their rich profile, delicate mineral flavor and amazing color. We also added sesame snow peas, toasted sesame seeds and finish off with a sweet soy and Shiitake glaze. This dish was the last dish I created for this season, but it has become one of my favorites. 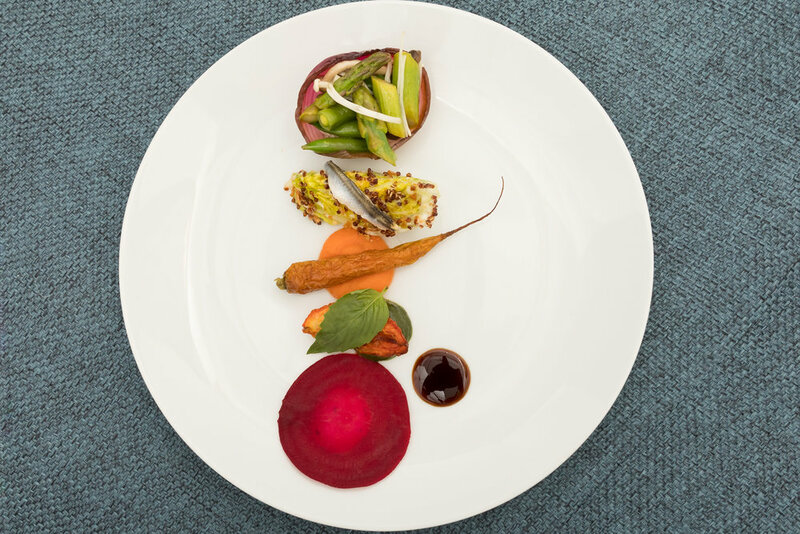 This dish is the ultimate vegetable tasting plate, featuring elements from The Plaza’s classic hits such as the “Beet Ravioli,” the honey roasted baby carrots from the “Arctic Char and Spinach Bavarois” and the onion petal cup from the “Beef Entrecôte”.